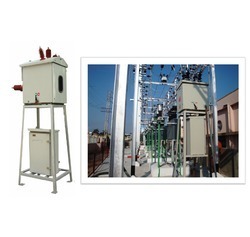 Keeping in mind the demands of industry and power sector, our firm is offering 33 KV Outdoor Vacuum / SF6 Circuit Breaker. The provided circuit breaker is designed to control the level of power supply with the safe limits to ensure efficient power supply to the devices. This circuit breaker is designed and manufactured under the stern guidance of our professionals using quality-assured components and advanced techniques in compliance with international quality standards. Clients can avail this 33 KV Outdoor Vacuum / SF6 Circuit Breaker from us in different technical specifications at industry leading prices. Over 100,000 mechanical operations, guaranteed. Specially designed, magnetically shielded, opto-isolation of electronics, thermally insulated outdoor cabinets ensure the active current carrying and breaking parts, associated electrical and electronic parts remain unaffected by prevailing environmental conditions, both manmade and natural. Light weight modular units make transportation of the whole switchgear possible in knocked down condition. Unique multi-pin plug-socket connections provided on multi-core cable between breaker and control cabinet make installation at site and connections very simple while being flawless. Needs no skilled man power to connect up the units. Positively driven breaker status indicator visible from ground level provided. Fewer components, linkages and direct coupling between vacuum interrupters and mechanism. SCADA Compatible design – suitable for either IEC 60870/103 or MODBUS protocol.